Plaque measures: 7" x 9" x 3/4"
where pure sweet love abounds. In rich and fertile grounds. and endure the days of rain. together we share the pain. that family bonds should perish. This wooden plaque is made from solid American Alder Wood and measures 7" x 9" x 3/4". 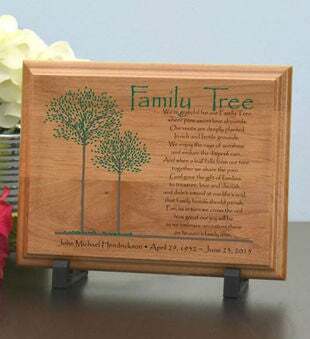 Memorial plaque comes with an easel to easily display and can be personalized with a name or the name and dates.